Pro-housing advocates criticize "NIMBYs" as being uncooperative and selfish. However that's not how the so-called NIMBYs see themselves. The difference is a question of the granularity of your analysis. A question I hear a lot is: "Why do NIMBY homeowners support zoning laws? Isn't it in their best interest to allow for the highest and best use so that they can sell their own property for the maximum price? Don't they want freedom to do as they please with their land?" At a first level, this analysis is correct. Homeowners do want to have complete freedom to build whatever they want on their own property (or to sell to someone who will). We'll call this the Individualist perspective. We are considering individual homeowners as our base unit of analysis. We're aiming for the maximum welfare for a neighborhood, i.e. a group of these individual homeowners who all have to deal with the actions of each other. Imagine you live in a suburban neighborhood with many single-family homes. There are 10 lots on the block, and 1 of them gets sold to a developer who bulldozes the small house and replaces it with a massive apartment complex. The 1 guy who sold to the developer is happy because he's just made a bunch of money, but the other 9 families now have to deal with the construction, a big change in the physical design of the neighborhood, and a change in the kind and number of neighbors they have. They aren't guaranteed to dislike it, but this big change invites a risk to their way of life. Since each owner has more neighbors than lots to sell, each one is more likely to be on the losing side of that deal than on the winning side. As a result, they are willing to sacrifice some freedom in what they do (or what their buyer does) with the lot in order to buy the control of their neighbors' behavior. Put more generally: in any given year each homeowner is unlikely to sell, but it's very likely that someone in their neighborhood will sell. Each owner has n-1 neighbors and there's only 1 of themselves, so summing up all their individual small likelihoods of selling produces a much higher likelihood that the community will change in a way unwanted by that neighbor. With this perspective, the rational thing to do is work together to add tighter zoning restrictions in order to curtail damaging behavior by your neighbors. We'll call this the Localist perspective. There will always be a few owners who are more interested in doing something controversial with their property than with maintaining the status quo, so it's not quite as simple as saying that all neighbors will suddenly work together in the interest of the overall neighborhood. 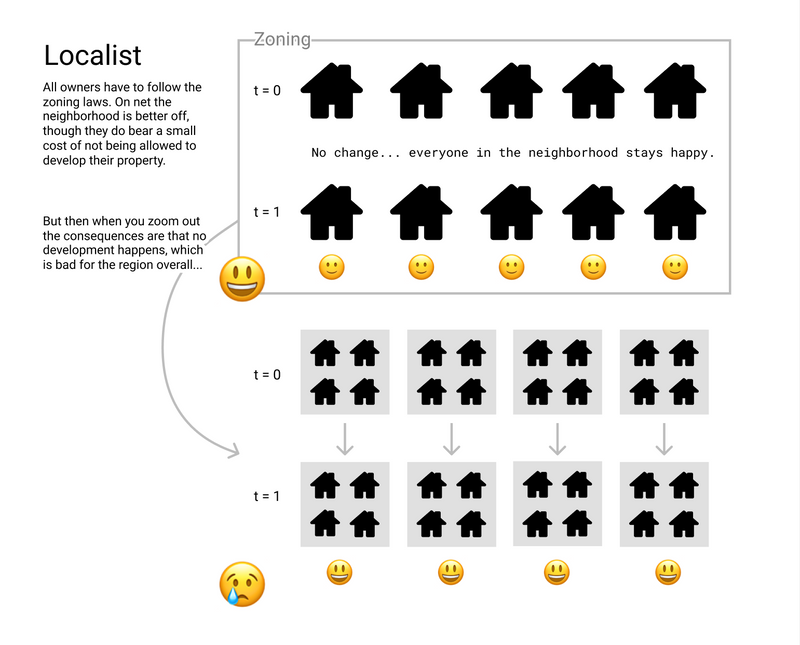 In any given neighborhood there's a mix of Individualists and Localists, and the ratio varies from place to place. Let's zoom out one more time and look at neighborhoods as our base unit of analysis, rather than the individuals that constitute a neighborhood. Growth and change are important for the health of a region's economy, so it's important that there's space for development as a whole, despite inconvenience in the short term. Development grows the size of the economic pie for everyone in the long run. This raises another question I hear a lot: "If development increases the value in a region in the long-run, why don't homeowners support it? Doesn't this increase their property values?" This is a good question! This growing pie narrative does seem to contradict the common pro-housing criticism that "NIMBYs" are just selfishly protecting their home values. This contradiction can be resolved if we consider the vast differences between (a) long- vs short-term ramifications and (b) communal vs personal ramifications. In the long-term, yes, good development will improve a region’s lot, and the community will be better off overall. However in the short-term, development may disrupt daily life, and gains will not be distributed equally throughout that region. As a concrete example: say development means building a new fire station. The region as a whole benefits—more fire safety!—but the next-door neighbors will suffer from the sirens going off day and night. It's important to not overlook the local, short-term costs that individuals might bear in lieu of whatever global, long-term benefits might exist. Those costs are the ones borne by individual homeowners, the ones that mean each neighborhood will tend to internally cooperate to retard local development. A region may benefit overall from development, but a region is made up of neighborhoods, and none of them wants to bear the brunt of that change. We're aiming for the maximum welfare for a region, i.e. a group of neighborhoods. To resolve this problem, neighborhoods have to cooperate with each other. We'll call the folks who advocate this kind of inter-neighborhood cooperation Regionalists. Ironically their goals look quite a bit for what the Individualists pushed for all along: allow for development. The difference is that this time we'll punish those neighborhoods that "collude" to restrict it. This time the tension isn't Individualists vs Localists but rather Localists vs Regionalists. The "ends" of the Individualists and Regionalists look very similar. Both want to remove zoning controls to enable development. The "means" of the Localists and Regionalists look very similar. Both constrain the behavior of the layer below (Localists stifling Individualists, Regionalists stifling Localists) to get their intended outcome. Individualists and Regionalists are odd bedfellows. In practice they can form a coalition to defeat Localists, but they tend to disagree on other things, and the same power they may muster here to constrain local behavior can also be used in other realms to vanquish other Individualist aims. As a result it can be scary for Individualists to cooperate with Regionalists. In conversations about housing, Regionalists tend to condemn the Localists as selfish and uncooperative, when it's really more of a question of what level of analysis you're looking at. These Localists are focused at the level of their local community and see their actions as maximizing the value for everyone in it; critics focus on a zoom level up and see that this local behavior creates global problems for the system. Both levels of analysis are correct. The challenge is determining which one should overrule the other, and under what circumstances. 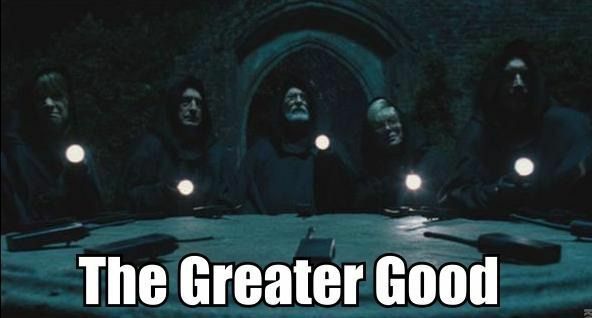 Both groups claim they're protecting "the greater good", but it's not so clear what that means. Are we talking about the good of our neighborhood or the good of our region? Both groups also assert that they are upholding "independence" and "self-determination", but again it depends on what level of analysis you're focusing on. On one hand Localists want to make decisions about how their communities function, while on the other hand Individualists want to make decisions about how to use their own property. It's also not so clear what it means to have "self-determination". Are we talking about freedom to act as we please or freedom from our world changing out of our control? I tend to be much more of a Regionalist (or sometimes an Individualist) than a Localist. However I do sympathize with the dilemma that the Localists face. Their home is where they live, where they raised their kids, and in most cases their single biggest asset. This of course does not give them a free pass. But rather than demonize them as selfish or irrational, it's important to understand where they're coming from. Epistemic status: 90% confident in the consequences of the simplified models I've laid out here, and 70% confident that those simplified models actually describe reality in a useful way. Epistemic effort: I've been thinking about these concepts for a long time. Last week I did a 1h quickwrite to brain dump my thoughts on the subject, then I spent two evenings revising those so they actually made sense. The result is what you see here. Purpose: I've heard these themes again and again throughout land use nerdom, yet I've never seen them laid out in one place so I think it could be useful to other people trying to understand the "common wisdom". Secondly, I'm curious to test this mental model I've built up over time, because I've come to take for granted that this is how people understand the game theory of zoning law but never actually asked in a comprehensive, structured way. So please do let me know if you don't think the ideas below self-evident, or better yet if you disagree outright! Why do NIMBY homeowners support zoning laws? Isn't it in their best interest to allow for the highest and best use so that they can sell their own property for the maximum price? Don't they want freedom to do as they please with their land? If development increases a region's value in the long-run, why don't homeowners support it? Doesn't this increase their property values?